When it comes to selecting the best counter surveillance tool for your needs, the BrickHouse Security team can help educate you on the tools available so you can accomplish your goals. 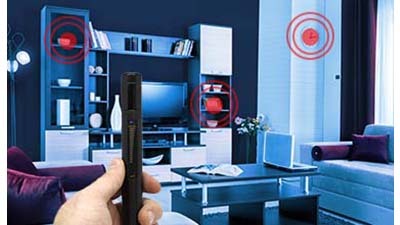 Today's hidden cameras can be concealed anywhere in a room. They can be mounted in walls, floors, or ceilings, or disguised as almost any common household object. And most hidden cams are impossible to detect with the naked eye, even by a trained security professional. But thanks to the unbreakable laws of physics, there are some fast and effective counter-surveillance solutions available. And you don't need any specialized knowledge or training to use them. BrickHouse laser camera finders are the simplest and most economical way to find almost any camera in almost any room, including wired and wireless cams. Regardless of how small or well-concealed it is, a camera's lens needs to have an unobstructed view of its subject to capture images. Laser finders work on a simple principle: If you shine the right kind of light on a camera's lens, you'll be able to identify it by its reflection. Laser camera finders include an ultra-bright LED light source and a viewing port. When you scan a room with a handheld finder, you simply look through the viewing port and press the button to activate the light source. If you see an obvious reflection that's not coming from a mirror or other surface, move your viewing angle slightly. If the location of the reflection moves as you move, then you haven't detected anything out of the ordinary. But if the location of the reflection doesn't move, you've very likely discovered the lens of a hidden camera. The most effective way to discover wireless surveillance equipment — whether it's monitoring you via a hidden camera, an audio recorder, or a cell phone--is with an RF detector. RF (Radio Frequency) information is present anytime a wireless device transmits or receives a signal. Cellular and cordless phones, Wi-Fi networks, Bluetooth devices, and audio/video transmitters (like those found in surveillance equipment) all create RF signals, albeit it at different frequencies. Most home or business Wi-Fi networks currently work at 2.4GHz (Gigahertz), for example, but some higher end wireless routers work at 5.8GHz. And cell phones work on a number of different frequencies, both in the United States and internationally. The RF detectors BrickHouse sells are designed specifically to detect the presence of surveillance equipment, and they all work on the same principle. The difference lies in the sophistication of the device. Pricier, more powerful detectors scan the entire RF spectrum; less expensive models are only designed to monitor the more commonly used surveillance frequencies (those used for cell phone spying, for example). The most important differentiators among audio/video bug detection equipment are sensitivity and selectivity. High end consumer and professional-grade RF detectors are better at isolating and reporting the specific frequency ranges where most surveillance equipment is operating. Some models give you a numerical readout that pinpoints specific frequencies as they're detected. More sophisticated detectors allow you to start scanning at full power, then gradually ratchet down their sensitivity to the point that the device's antenna needs to be within a few inches of the RF source. For real-world bug detection, that feature allows you to scan a room more effectively. Once an RF detector operating at maximum sensitivity has alerted you that there might be a wireless surveillance device hidden in your room, you can isolate its location much more easily as you decrease the sensitivity of the detector. When you're scanning a space for covert surveillance equipment, turn off any devices that you know are generating RF signals. As noted above, that includes cell phones, cordless phones, Wi-Fi routers, and Bluetooth wireless devices. If you're de-bugging a hotel room or an apartment, for example, you won't be able to control what's going on next door, but that doesn't necessarily hurt your ability to find audio or video bugs. RF signals can penetrate walls, but their signal strength gets significantly degraded when they are out of the line of sight of their target. That's why surveillance equipment is commonly planted in the actual room being monitored. While very expensive, professional gear can detect the presence of wireless bugs even when they're turned off. Most commonly available RF detectors need to lock onto an active signal. Some wireless surveillance equipment doesn't transmit signals continuously, so when you do an initial sweep of a room or a vehicle you should make sure to give your detector time to work. For example, if you're trying to find out if your movements are being tracked by a GPS device, an RF detector might take up to 20 minutes to find it. Although GPS systems gather location data via satellite, they report the data over standard cell phone networks. Some real time GPS trackers report every few seconds; others can be set to report only at 10-minute intervals. In addition to hidden camera finders and RF bug detection systems, BrickHouse offers a variety of powerful counter-surveillance solutions. Phone wire tap detectors can tell you if anyone's listening in on your call on standard analog landlines. Cell phone spy protector boxes eliminate the effectiveness of virtually all wireless bugging devices and technologies on your mobile phone, including Wi-Fi, GSM, DECT, GPS trackers, and more. Speech protection systems, including audio jammers and acoustic noise generators, allow you to create a secure, bug-free conversation in any room, even when a potential eavesdropper is only a few feet away.